The 76th EAGE Conference & Exhibition in Amsterdam was the biggest yet with more than 7,300 attendees – both conference goers and exhibitors. With the recent growth of the EAGE organization, the event can now stand tall as one of the largest multi-disciplinary geoscience and engineering event in the world. EAGE 2014 offered a six-day program that presented the latest developments in geophysics, geology and reservoir/petroleum engineering. Paradigm once again had a strong presence at the event and offered a rich technical program that blended advanced science, new workflows and services. With an ideal location at the entrance of the exhibit hall, Paradigm welcomed a steady stream of clients and professionals from the geoscience and engineering community. Quantitative seismic interpretation. Paradigm interpretation solutions facilitate QSI workflows that enable geoscientists to predict reservoir and interval properties earlier in the G&G cycle. Learn more. Geologic interpretation. Traditional geologists can do in a day what used to take weeks – well correlation, facies log calculation, cross-section creation and geological restoration. But more than that – advanced workflows as part of a robust 3D geological interpretation solution extend naturally into the modeling domain. Learn more. Formation evaluation. Rooted in Geolog 7, the formation evaluation product suite offers best-in-class petrophysical and geological analysis tools, well data management, superior graphics, and robust data integration. Learn more. Services. Combining our R&D strength and software interoperability with expert implementation, the Paradigm Services team collaborates with our clients to provide complete solutions, from seismic trace to drilling target. Learn more. Paradigm clients Geofizyka Toruń S.A., Geoprocessados and PetroTrace Global also shared their success stories with booth visitors covering three of the Paradigm domains. 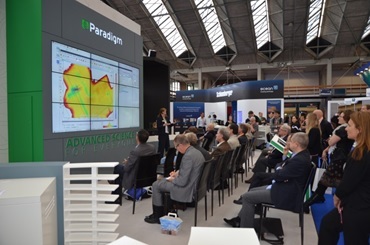 EAGE 2014 was also the perfect venue to announce SCDM Energie’s adoption of Paradigm SeisEarth as part of its corporate standard for comprehensive seismic interpretation and visualization. For the long-time Paradigm client, the inclusion of standard and advanced interpretation tools such as AVO and inversion made SeisEarth an obvious choice for its interpretation teams. The multi-survey solution allows interpreters to perform structural and stratigraphic interpretation across many different vintages of 2D and 3D seismic data, while integrating well data into their interpretation. One of many values we share with EAGE is a priority to support the recruitment and nurturing of young talent in the geoscience and engineering fields. EAGE has done this through an ever-expanding and innovative student program at the annual conference. Over the course of the week, we met with over 50 university students at the Paradigm exhibit space, sharing information about the Paradigm University program, career opportunities and Paradigm Online University. In addition to EAGE and the organization’s continued support, we would also like to thank our partners HP, NVIDIA, Lenovo and XtremeGeo for joining us at the Paradigm exhibit booth, working with us to provide maximum benefit to our customers. We will see everyone again at the 77th EAGE Conference & Exhibition, June 1 – 4, 2015 in Madrid, Spain!